Since the weather is not cooperating with plans to drive anywhere, I am staying put inside. Since I am housebound, I decided to take advantage of the opportunity and I spent the day quilting. 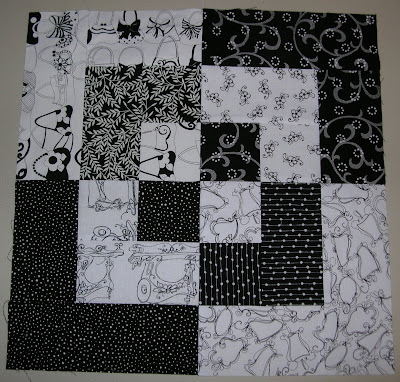 I have been busy today working on this black and white Bento Box quilt. 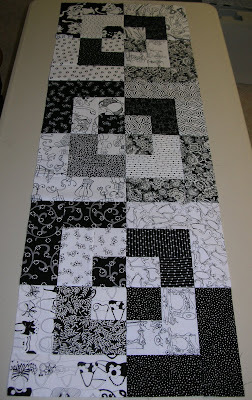 I have joined the on-line Black and White Quilting Project http://bwquiltchallenge.blogspot.com/ . I have always wanted to work with black and white so I have used the opportunity presented by the challenge to work on one of my black and white ideas–the Bento Box. The plan is to make this quilt lap size. I have a second idea I would like to try in black and white. Once this quilt is a finished flimsy, I will be able to use the left over black and white fabrics and start a second black and white project–a Disappearing Nine Patch (D9P). I quite often use a website called, Webshots–http://www.webshots.com/, as a source of inspiration for future quilt projects. I have seen both a black and white Bento Box and a black and white Disappearing Nine Patch there. All you have to do is go to the Webshots site and type in the name of a quilt pattern, add the word quilt and search. You are often overwhelmed by the number of pictures of that particular quilt pattern that will come up. This entry was posted in bento box, black and white, D9P by Norma Hanson. Bookmark the permalink. looking good! Looks like you will meet your challenge with this one. love it love it love it! so striking!! I’m not a fan of the Bento Box pattern, but I know this one is going to win me over. It’s looking wonderful. And btw, thanks for pointing out webshots. I’ve never been there and will now give it a try. We got a ton of snow this year too! Over 2 feet. Then yesterday it got warm and poured rain! now there is hardly anything left! And I LOVE webshots! I keep all my pics there! And your right – what a source of inspiration! It is going to be a terrific quilt, Norma! The Bento box is pattern is wonderful for these fabrics. I have always wanted to work with black and white fabrics together- perhaps I will have to try it too.. There are always more designs to make and quilts to create aren’t there.